Running a SMB doesn’t have to be tricky business. If you’re running your own company, every tool at your disposal counts; especially the ones that save you time and hassle. Crafty small- and medium-sized SMBs utilize web forms to drive revenue and reveal key insights. Let online forms do the heavy lifting for gathering customer insights, generating leads, collecting payments, finding new talent and keeping your employees happy. Here are the types of forms that can help your company thrive. Master this style of form, and use it often. Knowing how your customers, former customers, employees and prospects feel about your organization is crucial to staying afloat. Include scales and radio buttons to see trends in response data, and keep questions with written responses open ended (“How do you feel about …. ?” for example). The more you know about how your SMB is perceived, the better decisions you can make your about company’s future. 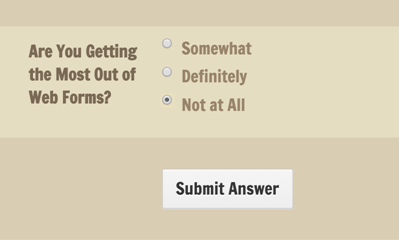 A great use for surveys is for your employees. Build a survey so your employees can vote for employee of the months, where and when a company party should take place, and even to collect sandwich orders for a company lunch. There’s no easier way to gather data. Are you asking applicants to send résumés to your email address? Creating an application form lets you manage all of your applications in a central login, and allows you to consistently collect all the pertinent information from each applicant. It’s easy enough to set up, and ensures an applicant's’ initial point of contact with your company is a professional one. A great lead generation form can turn your small SMB into a money-making machine. Customize your call-to-action button, and make your form visually appealing to get even higher conversions. If your website doesn’t feature a contact form, it’s time to give 2015 a try. A clean, clear, and functional contact form is the professional way to gather customer information, and to receive comments and concerns. Posting your email address is a dangerous gamble, and it can even be off putting to site visitors. Did you know you can collect payments for service using a simple form and a PayPal account? If you don’t need anything fancy - or your own full online store - then using a form for collecting payments for services, donations or subscriptions is a great way to go. Other than a processing transaction fee, setting the form doesn’t usually cost you any money. The great thing is that anyone can create awesome, custom forms. Using an easy-to-use form builder, you can knock out a fantastic form in just a couple minutes. Form builders are tools that any SMB can use, and it’s something that will save you loads of time and money down the road if used effectively. Chad Reid is Director of Communications at JotForm, a popular online form building tool. He’s written for a myriad of publications, including the Cincinnati Enquirer, recruiter.com, and multiple Patch sites.